Enjoy your summer knowing your family and loved ones are protected from invasive, disease-carrying pests. Protects your entire family from disease-carrying mosquitoes. This trap uses all of the proven mosquito attractants to draw the annoying and harmful insects away from where your loved ones gather. This is an easy-to-assemble, weatherproof unit, powerful enough to cover a full acre of land. 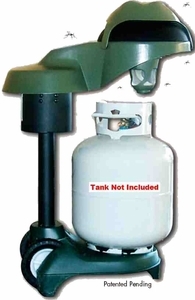 The trap requires the installation of a 20-pound propane tank (not included). Now you can eliminate mosquitoes and control deadly viral diseases carried by mosquitoes and other flies without harmful pesticides. The Mosquito Trap utilizes the documented attractiveness of carbon dioxide (CO2), moisture, body temperature (thermal imaging), color, shape and airflow in an effective design that captures and kills mosquitoes. Similar traps have been in use for years by universities, state monitoring programs and researchers around the world. The Mosquito Trap uses this traditional trapping approach, combined with the latest in research, to turn the female mosquito's natural hunting techniques toward seeking out the trap and facilitating capture in a product that private homeowners can use. To achieve the best results from your Mosquito Trap, you must leave it in operation full-time during the mosquito season. The trap is not meant for occasional use, such as during an outdoor party. Assembly has been designed for simplicity and no tools are required. The unit has 2, hammer-in, plastic ground stakes located on the base for affixing the unit in place. The propane tank then sits atop the base and stakes to further stabilize it. It requires the use of an approved, outdoor-use power cord for a 120 volt AC outlet and is for outdoor use only. Smartly placed rear mounted wheels make for convenient portability. Dimensions: 35" x 22" x 11"